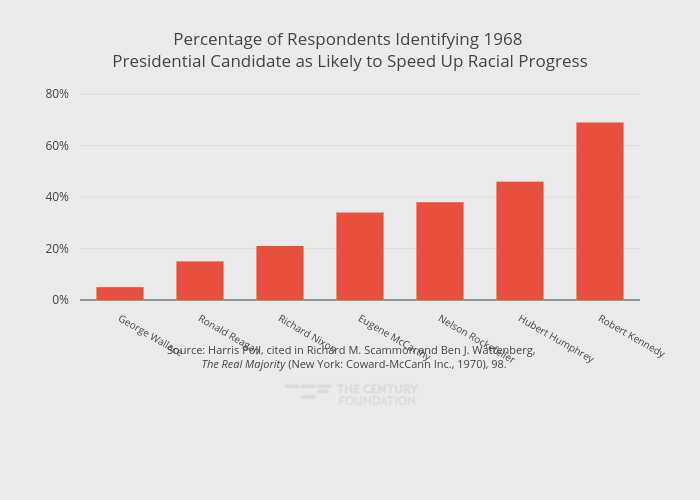 Thecenturyfoundation's interactive graph and data of "Percentage of Respondents Identifying 1968 Presidential Candidate as Likely to Speed Up Racial Progress" is a bar chart, showing Percent Change December 2016/17; with in the x-axis. The x-axis shows values from -0.5 to 6.5. The y-axis shows values from 0 to 81.63157894736842. This visualization has the following annotation: Source: Harris Poll, cited in Richard M. Scammon and Ben J. Wattenberg, The Real Majority (New York: Coward-McCann Inc., 1970), 98.